The AED Protective Cabinets are ideal for protecting AED units whilst still remaining visible against misuse, vandalism and accidental damage. 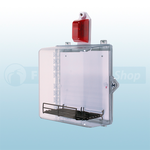 The units can be mounted on the wall to enable appliances to be stored in a central location and it can store CPR accessories also. 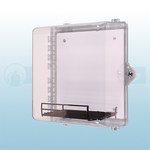 The cabinets are secured with a thumb lock which allows instant access. The units are also fitted with a sounder and strobe light which will draw immediate attention if the units are tampered with without authorisation.